For many years, the Hawaii orchid industry could supply white orchids for only a limited seasonal period each year. 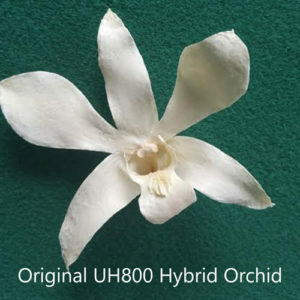 Then, in 1990 UH Manoa released UH800, a hybrid similar to existing popular white orchids, but which bloomed at a different and longer time of the year thus extending availability. This has been a great benefit since. 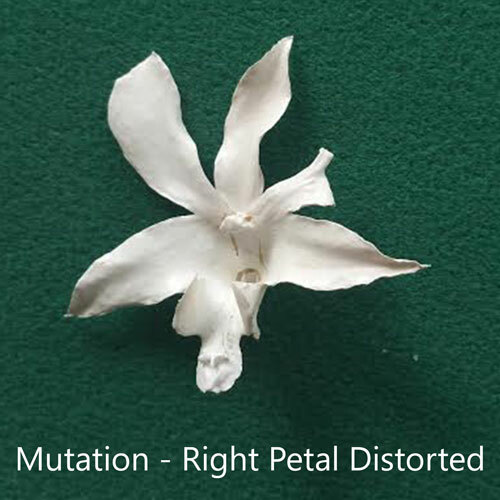 However, sometimes and with no warning, it produces flowers dramatically out of shape – the “Peloria” mutation. In one variety of these mutations the petals distort to heart shaped tips – much sought after for weddings – sometimes appearing several times per individual blooming, others not at all throughout a whole season. 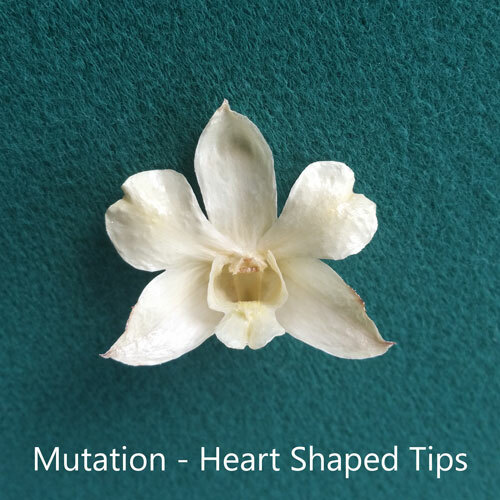 The biggest difficulty is finding these heart shaped mutations among all the other misshapen flowers. Worse, pairing them for earrings is like solving an incredibly complex jigsaw puzzle. But worse, how does one excite a bride with “UH800 Peloria Mutation”? Is there no romance left in botany? So, for the challenge and prospect of winning a wonderful prize of their own choosing (within limits! ), visitors to the Hilo Orchid Show were invited to give this beautiful flower a deservingly lovely and more appropriate name. Significantly more people contributed this year by comparison to a similar contest last year. It was gratifying to see the enthusiasm. All the names submitted were fascinating and many carefully thought out. Some were sent in by mail several weeks after the Show, from as far afield as the U.S. Mainland, Canada, Spain and Australia and had obviously been researched in the interim. This was not just a Hawaiian affair. My purpose was to select a name best identifying with this particular flower and its condition so that it would not be confused with other beautiful flowers. Hence therefore “wedding flower” was not an option as there are other popular named wedding flowers, particularly a beautiful white rose. 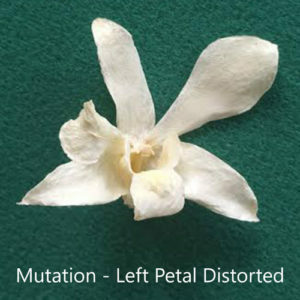 Likewise other generalities that could apply to more than one flower, such as “snow white” and “white heart” flowers were eliminated. There was no requirement that the proposed names be in Hawaiian, yet a majority were. This year’s flower does not have any connection with Hawaiian tradition, being a mutated dendrobium orchid hybrid developed by UH Manoa only twenty five years ago. 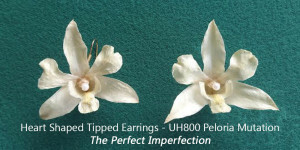 Finally, after much enjoyable and stimulating internal debate I plumped for “Imperfect Perfection” submitted by Marilyn Denio, of Hilo. I considered Marilyn’s oxymoronic phrase so appropriate as it is the very imperfection of the peloria mutation of UH800 that is its beauty. So, congratulations Marilyn, and grateful thanks to all contributors for spending your time so constructively thinking of my products. In return, Marilyn may select any item from my website as a thank you gift. Every other contributor will be advised a special code entitling them to a substantial discount on any items they may purchase from my website between now and 31 December 2015 with no minimum or upper limit. This note will be posted well in time for Thanksgiving, for which I wish you all happiness and close family ties. I will look forward to another challenge at next year’s Orchid Show. 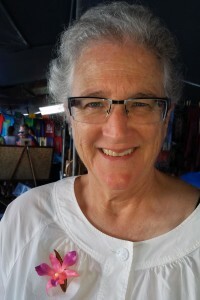 Marilyn Denio, the winner of Hilo's Orchid Show competition!